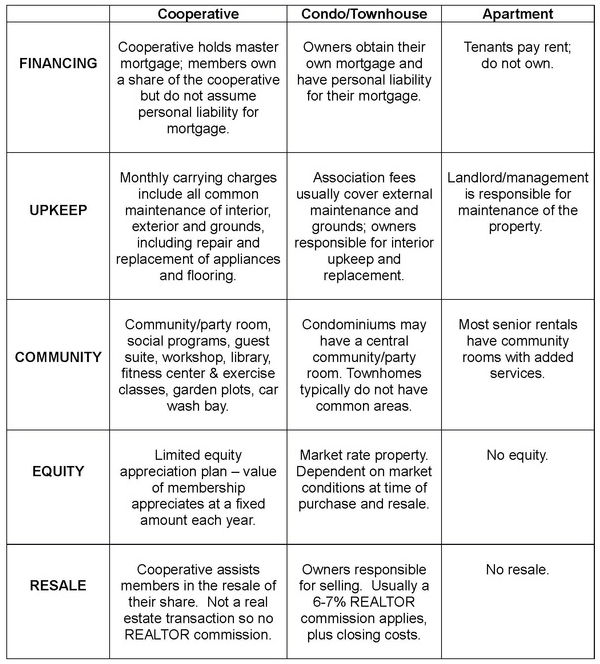 A senior cooperative is a special type of home ownership where a person buys a share in the whole cooperative (not-for-profit corporation), which includes the right to live in a specified home. A monthly fee then covers the costs of running the cooperative. See Gramercy Plymouth's pricing structure as an example. A property management company, like Ebenezer Management Services, runs day-to-day operations, but the members have a board of directors and many committees that shape how the co-op is run. It is not required of the members to participate, but it is expected. An active ownership makes for a strong community. Co-op living is for people who are independent and community minded that would like to be free from the trappings of single-family home ownership. People also move from apartments to co-ops for more freedom. The St. Paul, MN based Senior Cooperative Foundation has detailed information on the benefits of co-op living. Or you can contact our property manager, 763-531-9424.